Happy New Year friends! I hope you guys had a wonderful holiday! 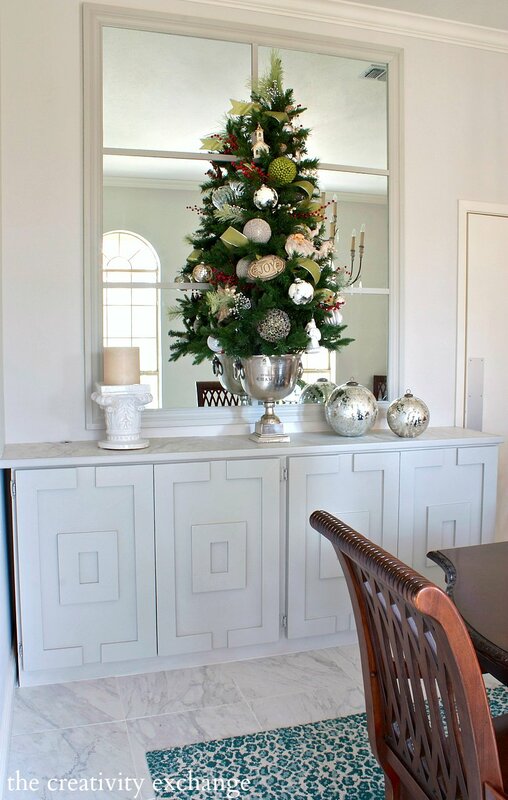 I’m back from my long break and ready to jump into 2015 and share with you a fun project that we did over the holidays. To keep this post from being way too long, I’m breaking it up into Part 1 and Part 2. You can find the detailed measurements and how we built the piece here on Part 2 of this post. 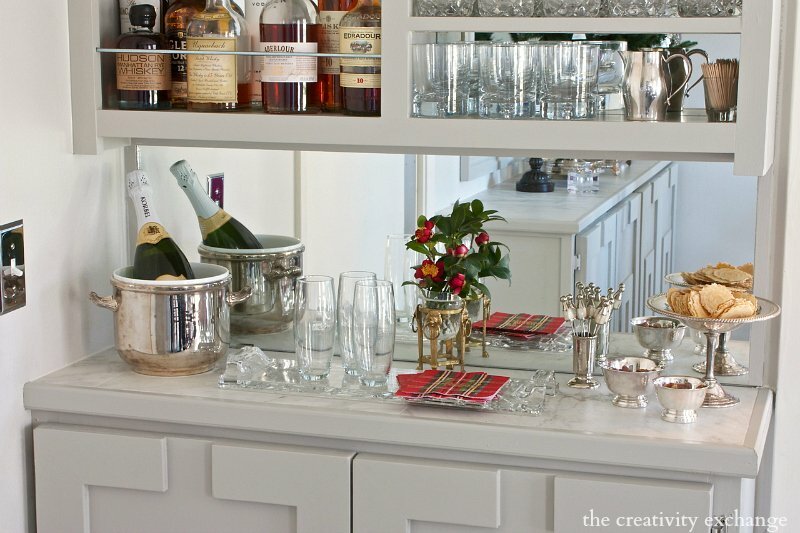 For years, I have wanted a built-in bar somewhere in my dining room for when we entertain. 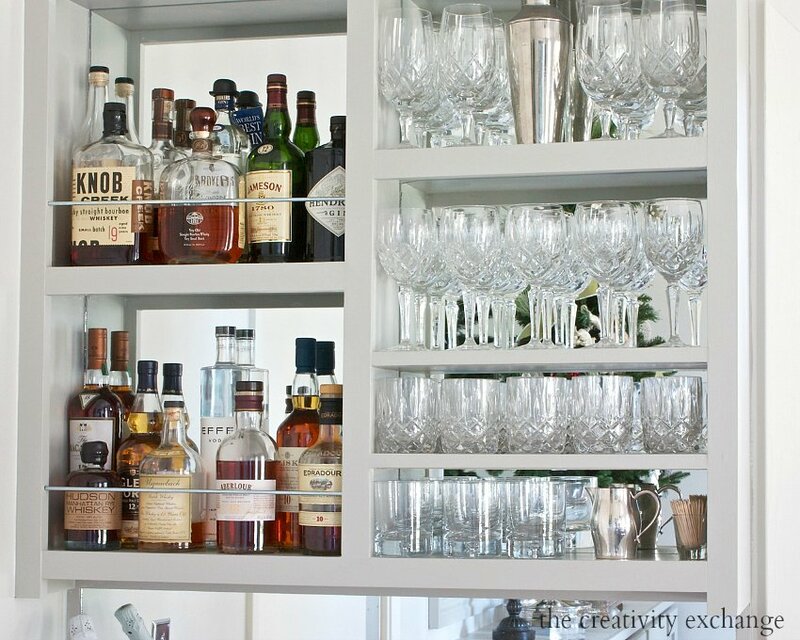 I have never had a place to store all of our barware, liquor, wine and when we have get-togethers, my kitchen is usually where I set up a bar on the counter. 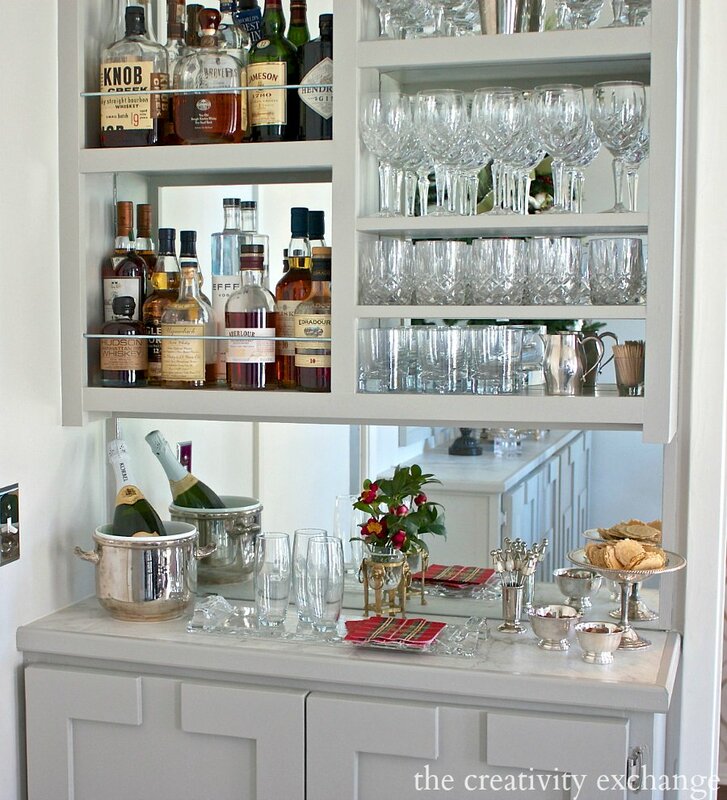 It get’s really congested in my kitchen during parties and I have always felt that if I had a dedicated bar space in the dining room, I could spread the party out more and I could create a whole new storage area for the barware, which would free up a lot of kitchen cabinet space. 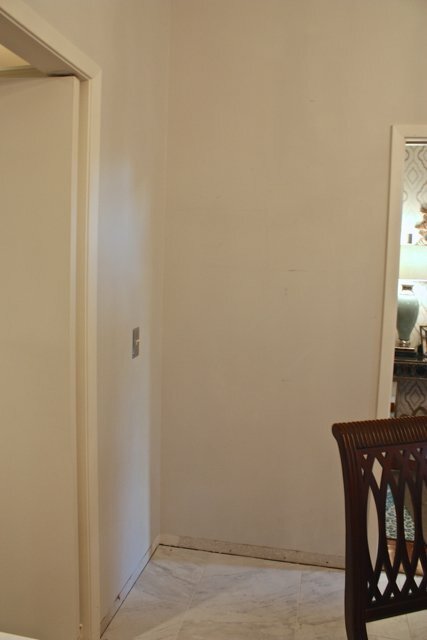 So, the day finally came and my contractor Jesús and I put our heads together to come up with the perfect solution using the narrowest of space in a corner in my dining room. Jesús and I LOVE these challenges and some of you may remember that he and I worked together on my mud room wall and our craft room, which was also very limited space design work. 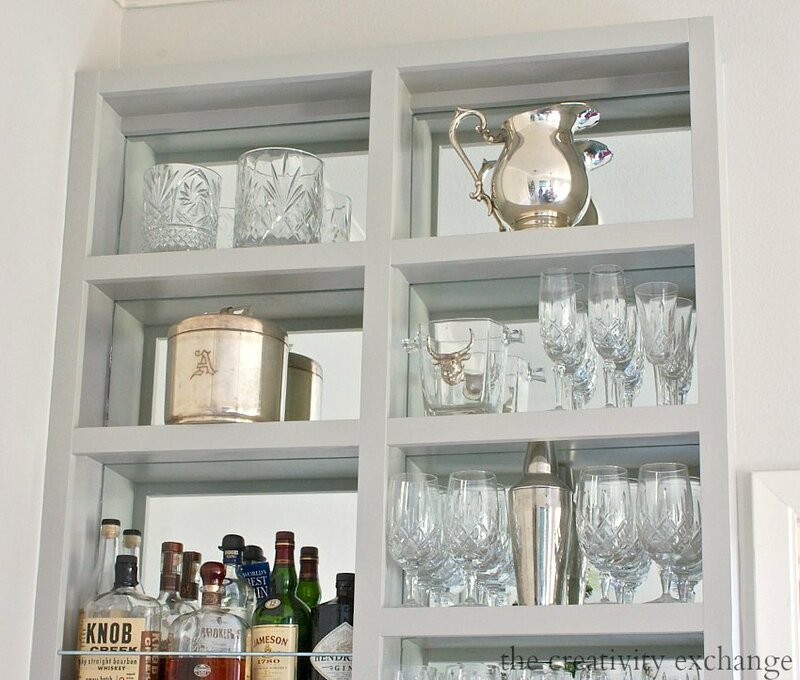 The bottom cabinet has two shelves inside and it’s where I’m storing extra glassware, liquor and bar accessories. 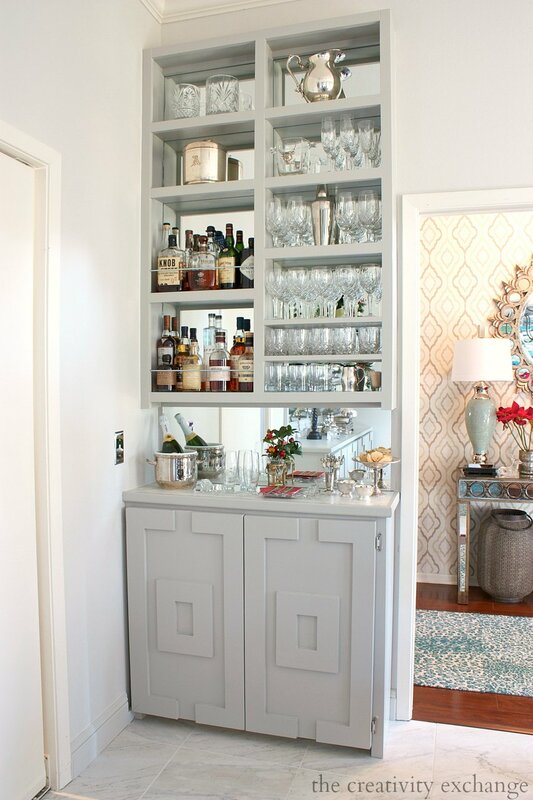 I would love to come up with a way to utilize the inside of each door to open and have bar accessories on the door. I’m kicking around something magnetic or maybe hooks. If you have any ideas or suggestions, I would love your thoughts! Yes! Much better and so gratifying that we were able to do it with very little space but that piece stores a ton of stuff! I have already used the bar during the holidays and I wish I had done this years ago. 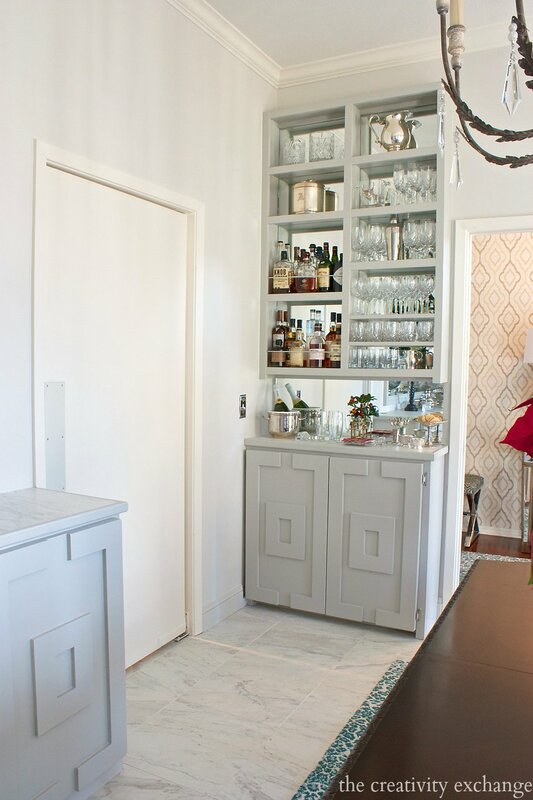 So if you have a little narrow spot like this in your dining room or kitchen and you too have always wanted a bar, I’ll be sharing all of the details and measurements on Friday. Thanks for stopping by friends and Happy 2015!! Sharing this post with The Best of the Nest linky Party here. Love this! Especially the mirrored back. Would love to have something like this in our dining area. Thank you so much Lauren! Can you believe that mirror was a last minute add on? I just kept looking at the shelves thinking that I had to have the mirror behind it. Happy New Year!! I love it – well done!!!!! Well, this is brilliant! 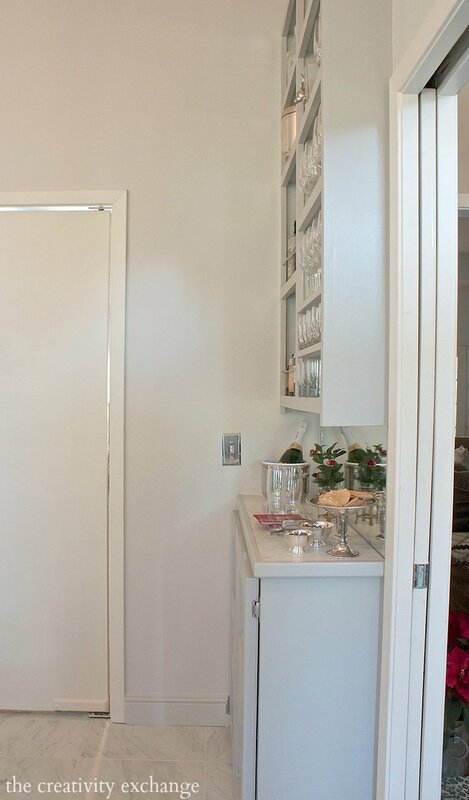 I would not have thought of so much storage in such a little space, and in what was a “dead space”! And it looks fantastic! Of course it does- you did it! I love how people can flow around it – with the 2 openings. What color did you use? Its gorgeous! The paint color is Mindful Gray by Sherwin Williams Susan. I use the color everywhere because it is the most perfect warm gray. Not too gray but just a hint of warmth. Thank you for stopping by and Happy New Year! Thank you!!!! My next DIY project was a small bar for my basement that is completely redone and design for a movie room for the family This is perfect. Fabulous job. Wow!! This is a dynamic, brilliant use of space!!! Very inspiring, in fact I think you have inspired ME all the way to giving this a try on my very small wall of my eat-in kitchen, only I will use mine as more of a china hutch… I have a few questions, but maybe they will get answers on your “part 2” post. 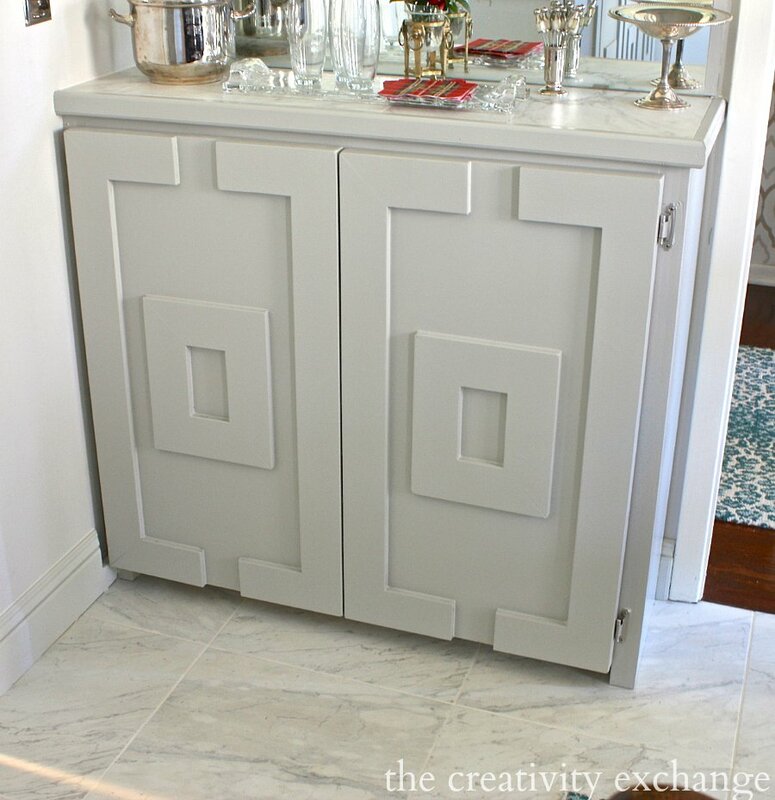 I am very interested in the source for the faux marble porcelain tile. It DOES look remarkably like real marble. Can you share that with me? Thank you for shorting this project and giving me a new idea for a solution to a problem area in my own home. I love THAT!!!!!!! I chuckled a little at the notion that we would ever have an actual PARTY, with ALCOHOL, and ADULTS, and so many people milling around that we’d need a dedicated bar space that was out of the way and didn’t get in the way of circulation, but I suppose our kids may just get older and our parties may at one point become a little less about pizza and juice boxes and yelling. What an exotic thought! Regardless of whether I personally would use this at this stage of my life, I think it looks absolutely lovely, and chic, and so very grown-up! Well done! Had to giggle myself Shawna! It doesn’t happen very much at our house either but as my daughter gets older, I think about the idea of entertaining more and more. The funniest thing is that my girl said it would be great for HER parties filled with lemonades, fun drink goodies and snacks. She loved the idea of it as well and maybe, we’ll share it with her! LOL! I’m hoping that now that we are set up a little better, this will get us rolling on a more regular basis. Thank you for your sweet note Shawna! Can you share any purchase info on the porcelain dining room tiles that resemble marble please? Hi Nancy! I am doing a post later this week on the floors with all of the info and some other good ones. Thanks so much! Really lovely bar! Great idea! Thanks for sharing! This looks awesome! Thanks for linking up! You have definitely given me some great ideas. Love this bar! Where did you get the chrome rods? I bought the chrome rods from Home Depot. They were used for door hardware but I cut to them to make rods. Hope that helps! Hi Cindy! I love this bar and your tutorial. 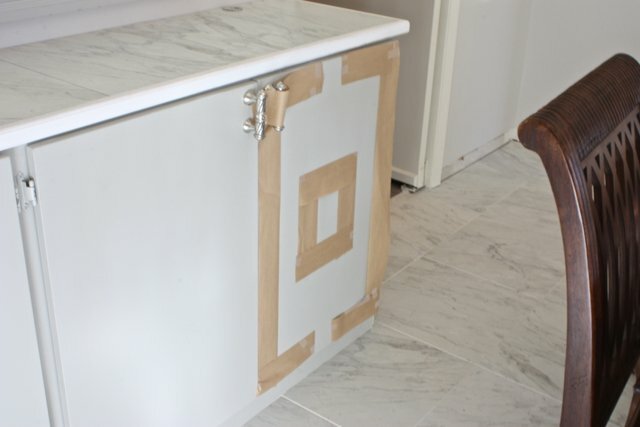 Could you tell me how you installed the chrome rods in the cabinet? I’m looking to do something similar. Thank you!